Since the late 1700’s and the early 1800’s are known as the Federalist Period, it is obvious where Federal Hill got its name. Around 1800, there were large areas of land, originally farms and orchards, in the geographic center of Bristol which owners began to sell for homes. This time event signaled the "beginning" of Bristol. One of the earliest houses built, the Miles Lewis’ House on Maple St. (now the American Clock and Watch Museum), was constructed in 1801. However, it was not until the 1870’s that the development of this area really took hold; construction continued until the 1920’s. Federal Hill had become the center of the town—the gathering area, so to speak. The Federal Hill green, located between Maple and Queen streets, served many purposes; it hosted all the social events and get-togethers. Even marriages were occasionally held there -- especially since two churches sit next to the green. "Military musters" (a lot of men were in the military) were also common on the green; perhaps they can be compared to the modern day "block party." To live on Federal Hill required money. When these homes were constructed, depending on the year, there were sold for approximately $3,000. Maybe that’s why its list of residents is rather impressive: Albert Rockwell (the founder of New Departure and the philanthropist who gave the city Rockwell Park), Dewitt Page (industrialist and philanthropist who gave the city Page Park), Epaphroditus Peck (a big industrialist of the time), Chauncy Jerome (owner of the biggest clock factory in Bristol), Titus Merriman (a well-known doctor of the time), and the Ingrahams (owners of the Ingraham Clock Company on North Main Street – to the rear of the first site of New Departure). While Colonial and Greek Revival architecture are present, the area is most noted for its Victorian style. Overall, the houses on Federal Hill are noted today for their intricate woodwork and craftsmanship fashioned by the likes of Joel Case, an eccentric turbine inventor-turned-builder whose houses were considered strange yet beautiful. Case left his mark on the neighborhood and throughout the city, building more than 60 homes and buildings. During the time, there was no such thing as "insulation," and therefore paint had to be replaced often because it didn’t stay on well. Of course, colors were limited to forest green, cranberry, brown, and mustard yellow because paint had to be mixed using pigments and these colors were the easiest to mix. Many of the homes featured elaborate wraparound porches, which served many purposes. They may have been the place to have "afternoon tea," which many women did, since they, of course, weren’t working outside the home; these porches certainly added beauty to the house itself. There is often a small slot for mail or a nameplate near the front door. Doorbells were usually made of solid brass, and grape leaves or scrolls were commonly portrayed. Floral gardening was quite extensive too, not only for appearance, but also because, in many cases, gardening was a hobby of the woman in the household. There was no indoor plumbing so there had to be outhouses. When homes later installed indoor plumbing, it was not uncommon for a bathroom to be placed right in the middle of a room, which allowed for easy installation. As a matter of fact, some houses have a bathroom squared off in the center of the kitchen because that area provided for the easiest construct of a bathroom. Also, storage space is scarce in all Federal Hill homes. Since life was much simpler in those days, one would only need a few items of clothing to accommodate his or her needs, so there was little desire or need for extensive closet space. One might only have only one set of Sunday clothes, work clothes, play clothes, and perhaps an item for dress. Most homes had a piano because families had to provide their own entertainment. (For this reason, families also played a lot of games and read extensively.) Because the dining room was the family gathering place, there was always a rug in there, which also helped in retaining heat Without heating systems at the time of the house’s construction, many factors were considered when building these homes. For example, the majority of the houses’ windows face the south; this allowed for the house to catch as much heat at possible from the sun. For the same reason, there are fewer windows on the north side. Stylistically, it was common to have insets of stained glass windows, perhaps above the door, marking the Victorian style of the time. This house, completed in 1892 for Walter Ingraham, then president of the Ingraham Clock Company, is an elaborate high-style Queen Anne. One of the few among the surviving Queen Anne houses that is constructed of patterned masonry, (which was considered exclusively high style and only built in a small number of urban areas), this house is constructed of brick and terra cotta with a base of brown granite. The surface is ornately decorated, especially on its coursing, chimneys, and window lintels. 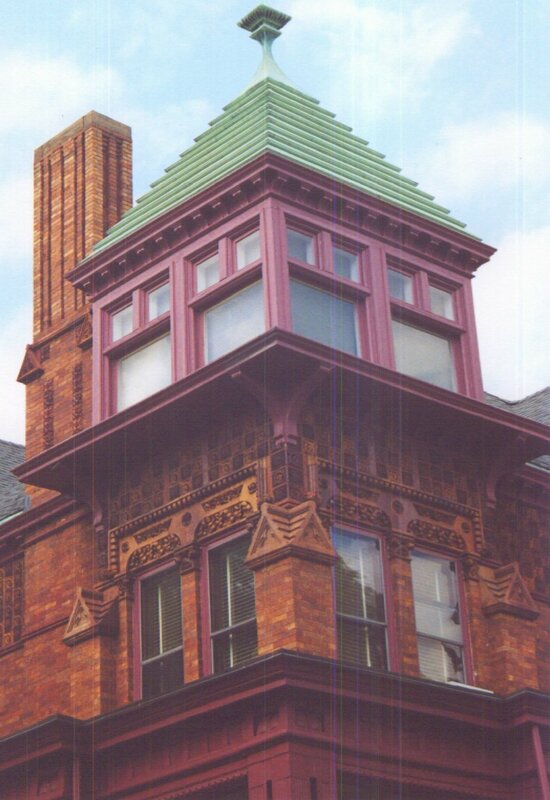 The corner tower with its copper roof and finial is elaborate and unusual, along with the porch columns. This house was heated with underground pipes connected to the furnaces of the Ingraham Clock Company. This fairly plain but extremely handsome Georgian residence still retains all its original exterior details, and its interior is extremely well preserved. Built in 1801, the Miles Lewis House currently serves as the American Clock and Watch Museum, offering the best information on Bristol’s history of clock making and on the history of clocks in general. It is open to the public afternoons from April to October. Inside the museum are hundreds of operating clocks as well as a section that uses the trusses and paneling saved form the 1728 Ebenezer Barnes house. One of the most unusual but well-preserved houses on Federal Hill is this miniature brick castle on the corner of Center and Main streets. It was built in three stages in 1880 by a local inventor and businessman, Joel Case, who built over 60 homes and buildings in Bristol by 1890. Strange even at the time of its construction, the house mixes styles, combining Italianate windows, towers, and brickwork with a Second Empire-derived roof and features of Gothic Revival in the details. The house covers 2,000 square feet and contains 12 rooms. There are 27 doors outside, 7 doors inside, and 57 windows. The lighting is both gas and electric; since electricity was new at the time, lights would convert to gas in case of power outages. Although restored by its present owner, Chris Bailey, this house suffered through the removal of two balconies and one of its towers, an interior conversion to multiple occupancy, and the addition of two overbearing porches. Also, the roof was slate and had to be repaired before the interior work was done. About 1000 bricks and 300 pieces of wood trim have been replaced, and over 17 truckloads of plaster, lathe and rubbish were removed. In 1924, a garage was added. After living there a few months himself, Joel Case sold the house to 24-year-old businessman, Charles Wightman, for $4,500. After many owners, Castle Largo remains in much the same condition as it was in 1880. Constructed for William E. Sessions, this elegant brownstone mansion, (a Second Renaissance Revival home in the Italian manner), is one of the finest examples of high-style domestic architecture in Connecticut and is listed on the National Register of Historic Places. It is made of Kibbe brownstone, which is harder than the common residential material used. A white marble ionic tetrastyle portico dominates the front, with swags and volutes of a pineapple design. Symmetrical except for smaller features on the left side and a slightly irregular window pattern, an intricate two-story music room is lit by the windows with half-round heads to the left of the portico. Beleden was originally part of a large estate, which required a staff of 18 men to service it. The property once included a sunken formal garden, a beautiful English garden, a pergola, a pool, greenhouses, grape arbors, and vegetable gardens. Although seemingly secluded now, there still remains a gardener’s cottage and stone coachman’s lodge. Architect Samuel Brown of Boston designed Beleden, and its interior is elaborately detailed in the finest materials. Included are gilded ceilings, Tennessee marble floors, and carved wainscoting. Although the library has wainscoting of Honduras mahogany, gold leaf wall stenciling, and a fireplace of gold and black Egyptian marble, the most magnificent space is the music room. In this room are an Estey pipe organ, a semi-elliptical balcony, and elaborate carvings, a few which hide chambers leading to the attic. Technologically advanced for its time, Beleden is made with steel beams and concrete floors, contained its own water filtration and vacuuming systems, and had a telephone in each room and outbuilding. Unfortunately, Beleden has lost most of its former grounds. American Clock and Watch Museum of Bristol, CT. Visitation: 3/13/2000. Hourihan, Chip. "Federal Hill." (tour guide pamphlet) 1985. Zoppo, Ellen. (Federal Hill Association member) Interview.